I actually had some time to do stamp last night! Yippee! I have been so busy trying to get my tax info prepped this week, that I haven't had time to do a lot of creating, and my fingers were itching to ink up this new set, A Kind Word. I think this set is absolutely adorable! I also wanted to play along with the Mojo Monday sketch for the week. I'm afraid that I didn't stay very true to the sketch and there's a good reason for there that. I plum ran out of room! I do like the finished product, though! I think my favorite part is the paper-pieced dress. Isn't that fun? 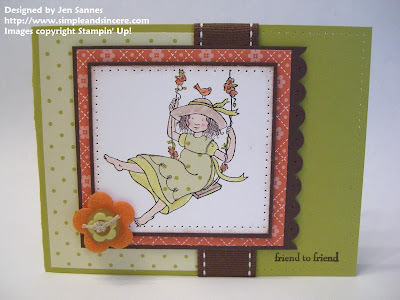 Lots of stamping this weekend - another yippee! This afternoon, we will be holding our first Big Shot club meeting and I will be demonstrating the butterfly card I posted earlier this week. Tomorrow afternoon, I get to meet with the Creative Consortium, my group of friends who I've been stamping with once a month for years. I SO look forward to catching up and stamping the afternoon away. Have a great weekend!